Here's a personal post since I haven't done one in a while. I moved back home. On a side note, I've been so lazy with all of my personal side projects. I wanted to update a bit on the game development front as I haven't posted anything regarding that in a while. I recently just finished my second foray into learning Unity having finished their 2D Roguelike tutorial. Definitely a lot easier for me to understand having tinkered with Unity3D and having developed 4orner. So I am trying to create another game using Unity as my technology of choice. Nothing as strict as my thirty day challenge as last time, but I plan on utilizing some of the mistakes and lessons learned from my previous experiences. As far as what kind of game I want to create, the pictures below are the initial whiteboard mock-ups I quickly put together. On a site note, I wonder what I should name it? Spoiler alert. Do not continue reading if you don't want the show to be spoiled. For some reason, I find it really difficult to relate to Chinese dramas. I find some of the characters in this show to be incredibly frustrating and it made the show really difficult to sit through. Had my goal not been to learn the language but rather watch and enjoyable show, I probably would've stopped watching a long time ago. Unfortunately, despite sunk costs, I still struggled through all the way to the end. I hated almost every character in the beginning that wasn't the son-in-law (姐夫). He was the only one who actually did practical things for the sake of the family and despite his "shady" dealings in the black market or ethically questionable businesses, he was the one character who I felt was actively doing something good. Every other character was just running around causing trouble and just complaining. For example, in the beginning, the father would constantly berate the son-in-law about his shady businesses, stating that his money is dirty and unethically earned. Yet the father still enjoys the classical songs and theater recordings that the "dirty" money bought. This made me hate the character with enormous passion. I was pretty happy when he died in the end. Most useless character ever. Every single other character in the show asks them "what happened"
I do not recommend this show. On a side note, refer to this blog post if you are curious as to why I am reviewing this show. Back to Japanese already! It feels like just yesterday when I started on this adventure to watch a bunch of shows and I've cycled through Japanese, Chinese, and Korean already. This show is quite different from the last Anime I saw (Code Geass) but it does not disappoint in any fashion at all. I loved each and every one of the characters and their personalities were quite humorous. The comedy and humor was very well-done without being too over the top. A lot of the time travel science stuff was kind of hard to follow, but this image timeline helped me understand it a lot better. It's really awesome how the creators are still creating content for this show that not only stays relevant but also does not disappoint at all. I loved the original 24 episodes, loved the extra OVA episode, thoroughly enjoyed the movie, and even watched the short animated clips online. Overall a fantastic Anime. Very satisfying show. Plenty of interesting characters and funny moments that kept you guessing all the way to the end. The end was very happy and left me feeling all giddy inside, which I appreciate from some of the darker shows nowadays. Because I watched this without subtitles, I feel like I missed a few things throughout the show, but it wasn't too hard to keep up even with the 부산 사투리 accents. I even picked up some new Korean slang words, haha. Very underwhelming drama despite the reviews and recommendations from friends and the internet. Unfortunately, the production quality severely detracted from my experience. For example, for an action cop show, a lot of the shooting and explosions were super cheesy and very fake. I found myself fast forwarding through all the action scenes. The show also takes forever to ramp up. It took around 15 episodes for me to somewhat enjoy the plot and appreciate the story. There were so many instances where characters in the show knew what was going on but would never reveal it to the protagonists for seemingly no reason at all. If I had a dollar for every time someone in the show asked "怎么回事" or some variant of that (到底是怎么回事) and the response was just silence, I would be rich. I don't understand. Is it customary to not answer when asked what is going on in Taiwan? Very frustrating experience. Hands down the best anime I've seen so far. But that's not to say that I'm an anime expert of connoisseur by any means. I've also enjoyed Attack on Titan and Death Note. If you're a fan of dark thought-provoking themes, then this is definitely a must-see. I enjoyed every single episode (even the light-hearted "filler" episodes) There were many twists and turns that left me speechless and with each end of an episode, I found myself immediately starting the next one. One of the best endings of a show I've ever seen. A lot of people debate on whether or not Lelouch is dead at the end and I personally really want him to be alive, but of course it's up to interpretation. Haven't blogged in a while, so I figured it's a good time to post something about my own personal life. Lately, I've been watching a lot of shows. I am trying to alternate between Japanese, Chinese, and Korean shows so that my language skills stop deteriorating from lack of use. While I'm only two shows in, it's been a fun experience so far. So I've decided to start a section in my blog where I review the shows I watch. You can find a complete list of these review posts under my Reviews & Guides label. In addition, I also made a YouTube playlist of my favorite songs from the shows that I watch. Haven't blogged in a while...not good. So here's what I've been working on in changelog format. On a side note, still a lot more work to do before this project is ready! This is an apology post. An apology for not posting when I promised to post every other day in my recent post. So here's an update to what I've been working on this week. It's pretty difficult to stay on track of these blog posts when I have a full-time job and can only dedicate a few hours each day in the evenings to code. So please forgive me for preferring to code a little bit more rather than blog about what I've been developing. So now I will promise to update weekly on the status of this project. And since it's still not ready for release just yet, I will start the changelog version at 0.01. On a side note, I absolutely love changelogs. It takes me back to my childhood when I would read the latest patch notes from World of Warcraft. Hurray for increased motivation (even if it's temporary). It's been almost two weeks since I completed my 30 day challenge so I figured I'd post about what I've been doing since then. It's not a surprise to me that I haven't been doing much. The feeling of completing 4orner was amazing and it was a great achievement on my part to be able to stick it through and make something from nothing. But that motivation and energy seems to be very fickle. Maybe now that I am not publicly working on some project, it's pretty hard to stay focused and on track. But I want to change that. So I've decided to get back on the horse and start blogging about what I am working on. No need for secrecy--especially if by publicizing I can fuel my motivation. Not sure if I want to do something as intense as a 30 day challenge, but I will promise to post at least once every other day to start with. Let's see how far that gets me before I have to post another apology about my unstable motivation, haha. On a side note, the project I am currently working on is called dotaplays. Now that my #30daydeveloper challenge is over, what's next for me? I am not quite sure but I am incredibly overjoyed at the response my game has gotten so far. It's amazing to hear how my little game has made a positive and inspirational impact on total strangers across the internet. What a world we live in. I strongly believe that a great game developer is one who listens to the community and continuously strives for that perfection--no matter how far away that may be. So it is my duty to keep updating 4orner as feedback is received. On a side note, thank you everyone for your feedback! On a side side note, play the game here or here! On a side side side note, read about the development process here! Below is what I wrote for this Reddit post. The purpose of this post is to document my findings and epiphanies from my thirty day challenge of making 4orner. It is my hope that my experiences can help motivate you to achieve your goals—whatever they may be. (And also motivate myself for any future projects). Hello! If this is your first time reading about my thirty day developer challenge, click here to go to the first post! On a side note, look out for a complete review of my thirty day challenge tomorrow! Today I decided to finish up how the game plays on mobile browsers. Perhaps tomorrow as my last day I can learn PhoneGap and create a standalone application. About 4orner, which you should know all about if you've been reading my blog posts, right? On a side note, just one more day left! I can do this! Only two days left. I can almost taste the finish line (two idioms mixed here). Today, I implemented levels. Every hundred points, the level goes up by one. With each level, enemies move faster. Every two levels, enemies spawn quicker. And finally, every ten levels, enemies spawn in greater numbers at a time. The highest level I managed to get to myself was thirty-one with a final score of 3190. Do you think you can beat my high score? 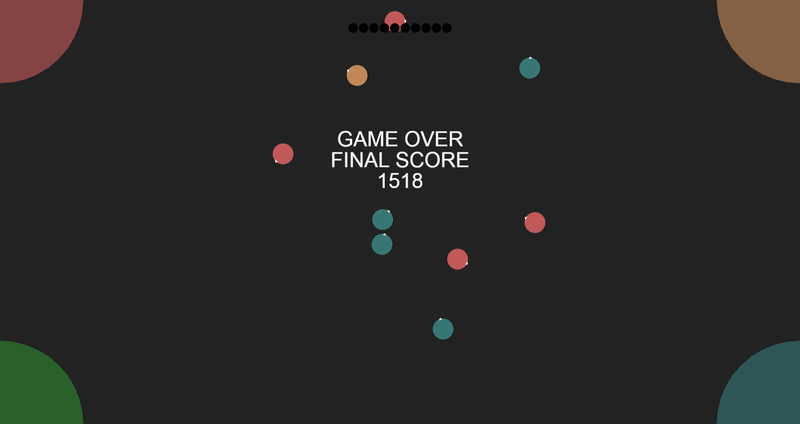 If you're finding the beginning too slow or boring, here's a tip: since enemies move relatively slowly in the beginning, it's really easy to collect the highest combination of balls to maximize your score with a single submit (alternating, full inventory, and two color). Doing this brings you up to level seven or so immediately, drastically increasing the pace of the game. On a side note, I got nothing today for you here. With only four days remaining, I realized I should probably start writing a bit more. This challenge wasn't just done to create a cool game (in fact I had low expectations of being able to complete a game) but more to figure out about myself and my work habits. The full write-up will be delivered at the end of the thirty days, but as you can see from my blog and my almost complete game, things are going pretty well. On a side note, I still need to polish up the game for mobile--that might be the final mountain to climb in my challenge. On a side note, only five days left in my challenge! On a side note, what do you think of the font? Should I keep it? Today was a bit of a slower day. Game over, try to beat my score? On a side note, only one week left! How much further can I get? On a side note, do you think the multipliers are fair? Or are some of them too many points for too easy of a task? Today's change will be in changelog format because I realized that I love writing changelogs and these posts should've been like this from the very beginning. Multipliers are now in place! On a side note, still need some way of letting the player know which multiplier was activated. Oh my god, I think it's actually fun now. I've been playing my own game and it's quite entertaining. Of course it's nothing like what I first envisioned at all. From sound design down to the core gameplay mechanic, this game is nothing like what I had mocked up on the first day. See the inventory on top? Those are the balls I am currently holding. Added an "inventory" system for holding enemy balls. Now when time stops, you "cash in" your inventory for points. I want to implement score multipliers that depend on what you were holding in your inventory when you stop time. So please, go ahead and try the game. Let me know what you think! On a side note, I am actually genuinely excited about this. This is a great feeling. So today I added a limit to the time stop ability. You can now only stop time for 200 milliseconds before it goes on cooldown. However, the game still isn't all too fun to play. It was very cumbersome to stop time and to alter the direction of each and every enemy ball to send them to the correct corner. And given the new time limit, it was pretty difficult. So I changed it that once an enemy ball touches the player, it disappears. This solved the problem of a million enemy balls cornering the player and a negative score in the tens of thousands. I also changed the spawn pattern to a random location a set distance away from the center of the screen. But yet, it was still relatively boring to play. Here's where I created the player color mechanic. Now you can drag the player ball wherever you click without needing to stop time. 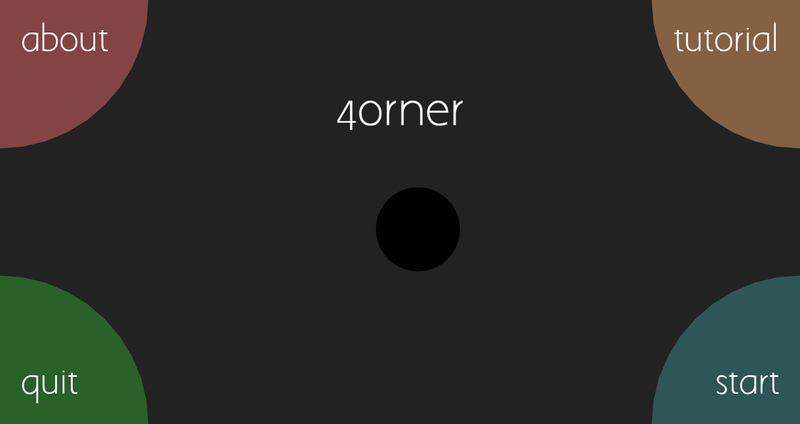 In addition, when the player touches any of the four corners, the color of the player ball changes. 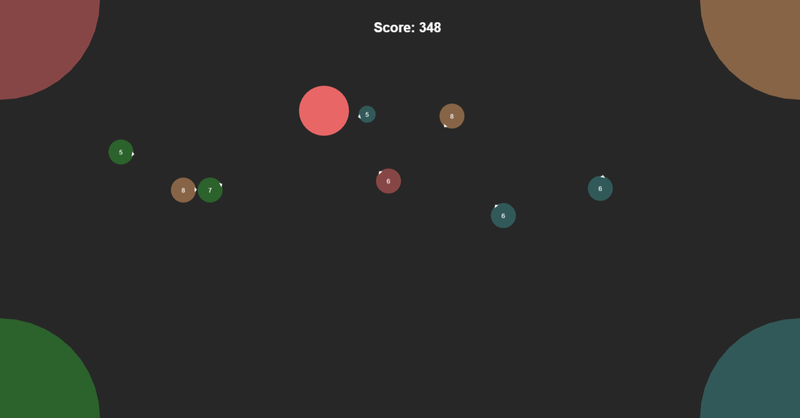 This way when you collide with any enemy balls of the same color, your score goes up. 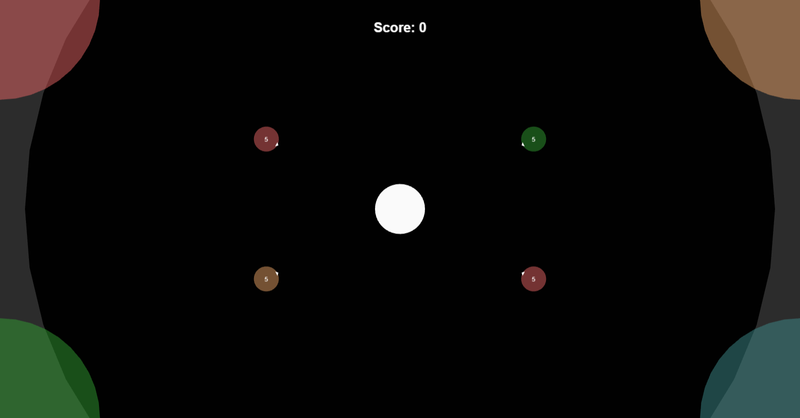 In addition, when time is stopped, the player can collect any colored ball for a neutral score. I had to implement this feature because if you cannot keep up with the enemy spawn times, then the number of enemies becomes pretty overwhelming. I have to admit I am finally at a point where I can see some semblance of fun in this game. I guess I didn't really have a goal or anything when I set out on this journey, but it's really heartwarming to know that my time isn't being completely wasted, haha. At least I'm learning a ton about Phaser. And who knows? This knowledge might go a long way in some future endeavor of mine. 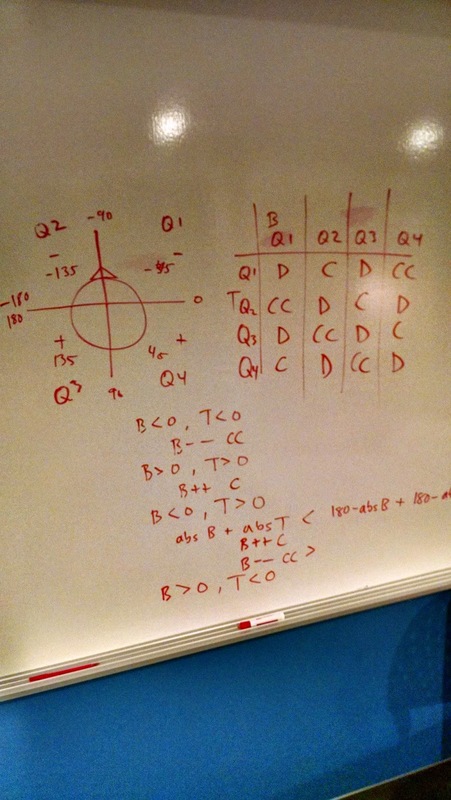 On a side note, game design is really hard. I had always thought that the technical part of actually making the game was the hardest part, but that is slowly proving to be false with this thirty day challenge. Wow turn rates were really difficult. Who would've thought that I should've paid more attention in high school trigonometry class? But I managed to get turn rates working after a good amount of whiteboarding. The problem essentially was the way angles were being calculated. The ball may be facing -175 degrees, but if the player was 175 degrees, then the logical way to turn was counter-clockwise, but due to the way I was calculating the angle differences, the ball would turn almost a complete 360 degree turn towards the player. Therefore, I had to calculate out each specific scenario of ball versus player angles. What quadrant are they in? Are they negative or positive? Which direction should I turn towards to get the correct angle fastest? In addition to turn rates, I also implemented spawn animations. 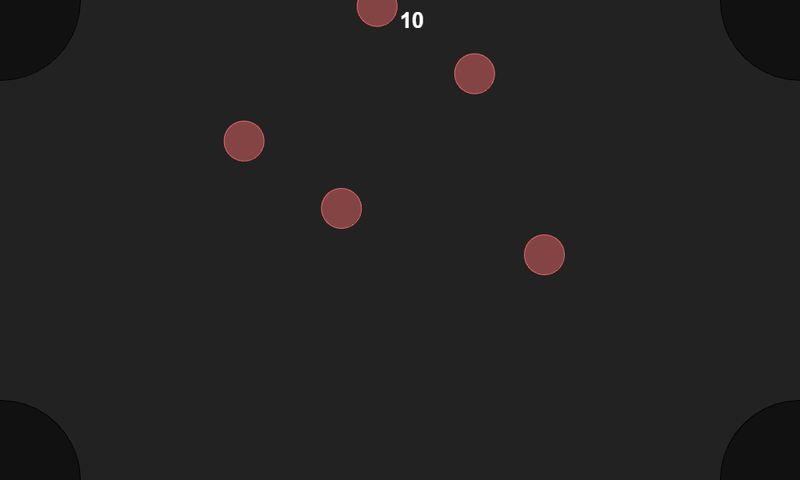 Now the balls grow in size before beginning to target the player. Once the ball reaches it's maximum size, it starts towards the player. If the angle towards the player changes, the ball comes to a stop before recalculating the new angle. You can also click on the ball to force an angle change. This mechanic combined with the ability to stop time should allow players to launch enemy balls into the correct corner. An update wouldn't be complete unless there was a change to the scoring system, right? Now balls don't disappear when they collide with a different colored corner. They just simply go through. 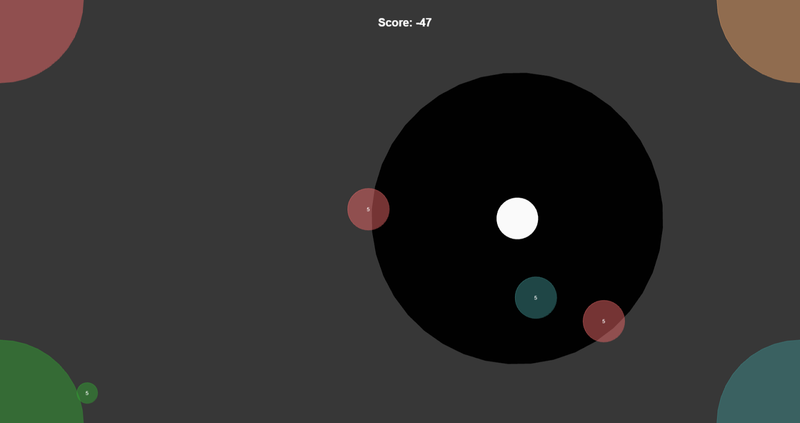 Whereas if the corner and the ball color are the same, then the ball's current net worth is added to the player score. In addition, every time a ball collides with another ball, their respective net worths go up. This way, the player has incentive to bounce balls against each other before shooting them into a corner for maximum points. On a side note, my lower back really hurts. Today I cleaned up my code a bit so it's a bit easier to read. Unfortunately because of the nature of this thirty day challenge, I haven't been really keeping my code all too clean. Which is getting to be a problem because of all the stuff I am trying to implement. Perhaps I should have kept that in mind from the beginning. Since yesterday's major changes, the game currently has no real purpose. The core game mechanic of being able to influence enemy ball directions is yet to be set up. But today I took major steps in the right direction. Right now, enemy balls move at a constant maximum velocity at an angle. The angle is determined with each step as the angle between the ball and the player. I also created a small white arrow indicating the current direction each ball is travelling in. In addition, the enemy balls spawn from four different locations. Their colors are still random, but that's subject to change. I also made them half the size of the player. This is also subject to change. On a side note, I really want to implement turn rates but it's proving to be pretty difficult. Perhaps my second mountain to climb? Okay so I cheated and combined two days into one post because I was lazy yesterday and didn't feel like posting anything. Maybe I should make Sundays my days of rest. Everyone needs to take a break once in a while, right? So since I've realized how bad my game was, I have set out on a journey to make it more fun to play. 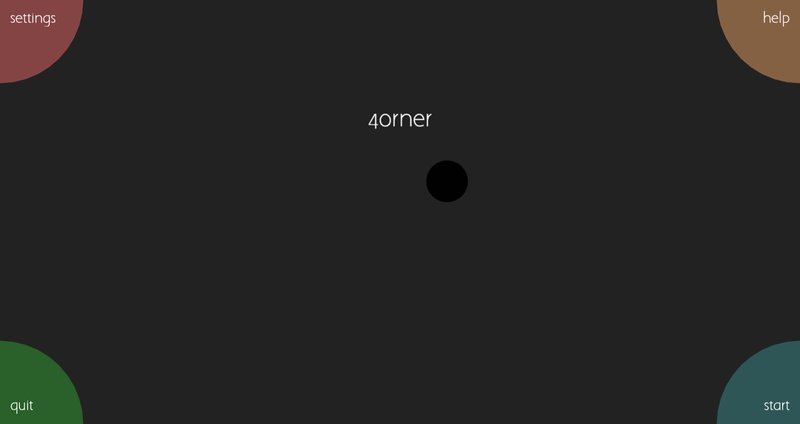 Today, I created a black and white player controlled ball that you moves with the mouse. In addition, when moving the player ball, time stops for the other enemy balls in the game. I really like the visual and audio effects that are currently in place. When time stops, a large circle expands outward from the player ball and covers the whole game screen. Concurrently, the background music stops playing and is replaced with the sound of a ticking clock. Really cool stuff. In addition to the time stop mechanic, I also tweaked the scoring system a bit. 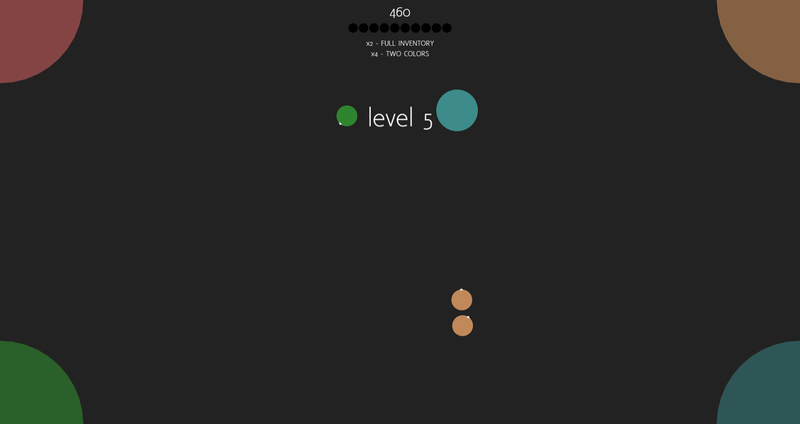 Now when a ball of the same color as the corner disappears, you gain five points. If the colors are different, then you only get one point. Finally, if any of the colored balls hits the player, you lose five points. As far as the scoring system goes, everything is still a work in progress and subject to major tweaking or overhaul. On a side note, I actually can't stop stopping time. This is really fun! On a side side note, I can't believe I'm already halfway done with my thirty day challenge! I don't know if I'll have enough time to finish, I still feel so far from done. This game is terrible! It's so boring and I have absolutely no fun playing it. Even as the creator, it's really hard to muster up any desire to play this game for anything longer than five seconds. Albeit it's still just a prototype and not all the features are fully fleshed out yet, but it's still pretty damn boring. I am getting more and more worried that no matter how much I polish this game, the underlying core game-play mechanic of "dragging balls to corners" is just simply not fun at all. So I definitely need some form of reworking the major game-play aspects. First I disabled the ability to drag or flick the balls. This may seem like a step back considering the amount of work I put into learning how to do this feature, but it makes a lot more sense once you consider my next idea. Next, I enabled a pause time feature. While the mouse is held down, nothing will move and the music will pause. (exactly which button is held down is still subject to change). This is because I want to experiment with semi-real-time and semi-turn-based game-play. My idea is to create a player controlled circle (with health points perhaps). When this circle is dragged, time stops (or simply slows down, similar to the game SUPERHOT). While time is stopped, you can alter the direction the balls will be travelling, causing them to collide with other balls or one of the four corners. This might create a much better experience for the player as now you have to dodge balls in addition to trying to get them into the four corners. On a side note, making games is a lot harder than I thought. Or rather, making fun games is a lot harder than I had thought. Today I didn't have as much time to tinker as I wanted. There is just simply too much I want to do and it's very difficult to keep on a straight track when my mind wanders and I take so many detours on the way. Today, I fixed the mobile version, now the game fits perfectly in my phone screen and it works pretty well for the most part. It's just not as fluid as I'd like it to be, but what else can I expect from a prototype, right? I hope that as I keep working on this, it'll become a more responsive experience. In addition, I also got rid of the timer at the top. 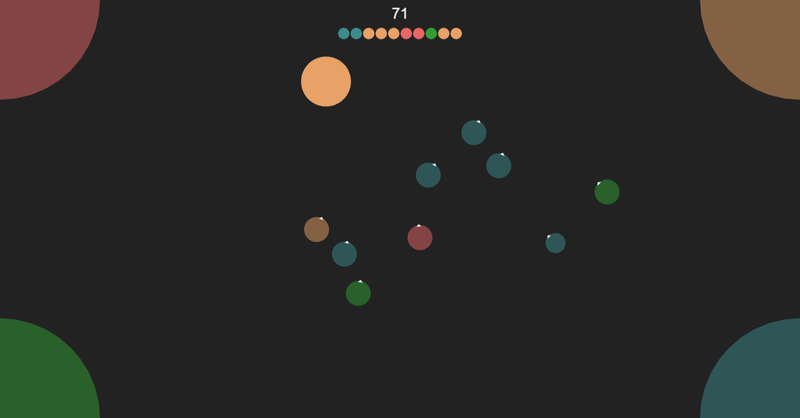 I want to experiment with music and spawning the balls to some background rhythm. 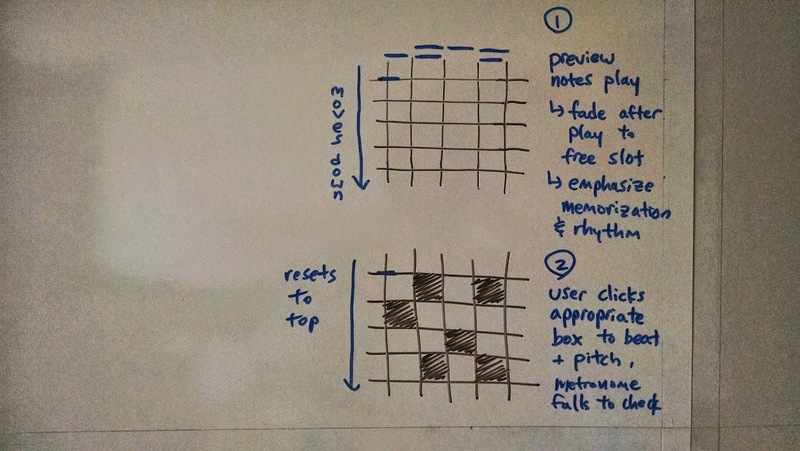 Then with each interaction create a sound that might all mesh together to create some sick beats. I tinkered with this yesterday when I played with audio, but it just increased load times by over two-fold and was simply unpleasant to listen to. But I hope it'll be better in the final version! Right now, each ball is only worth five points, but I have plans to add multipliers and other ways of combo-ing them to increase their values. Be on the lookout for that! On a side note, I'm so hungry right now. #30daydeveloper - Day 11 - Sounds Good! Today I toyed around with adding sounds to my game and, I have to say, sound design is really hard. I have no idea what would be an appropriate noise for every single interaction in my game. What noise should the balls make upon collision with each other? What about when they're being sucked into a corner? Should a noise be made when you click on a ball? Does every interaction need a sound counterpart? I have a general sense of what I want my game to sound like (heavy techno, fast beat / minute) but it's really difficult to find satisfying sounds from royalty free websites. Maybe I need to find a sound designer friend who'd want to work with me, haha. In addition to sounds, I fixed mobile touch input. Although it loads very slowly on mobile (most likely due to the large sound files) there is not much noticeable lag. But that might also be due to my relatively higher end Android device. I'm sure if you had an older model or a legacy smartphone, it'd run into some frame-rate issues. I'm still trying to get the mobile version to look better. Currently I am having some issues with the screen width and height. The same issues that I ran into when I had to design my personal website to be more responsive. On a side note, anyone know of any good free sound databases? So now that the game's prototype is finished, I should start adding bells and whistles to it right? Or should I keep updating the core functionality of the game? Not that the core functionality is all too complex or anything. I once read an article suggesting that the core game play mechanics are the most fundamental key to a game's success. Every game can be simplified down to 20-30 seconds of "core" game-play that is repeated over and over throughout the game. Therefore, if this fundamental piece of the game is not interesting or entertaining to play, then chances are that the game will also be boring. There's only so much you can polish a piece of turd, right? I wonder if this is true. Are there any games out there with lame "core" game mechanics, but yet are very addicting and fun to play? Will adding shiny gadgets and score multipliers do more for my game than updating the main game design? On a side note, wow I guess I still have a lot more mountains coming up, haha. 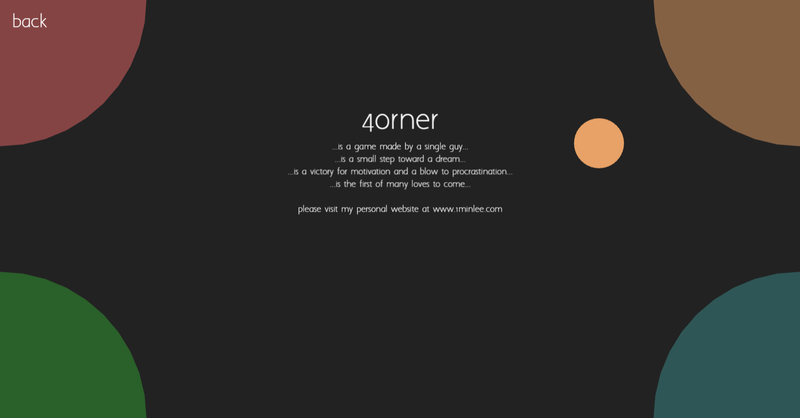 #30daydeveloper - Day 9 - Introducing 4orner! Four corners, or 4orner, is the tentative name I've settled on. And I am proud to present the first version that I am proud to call a working prototype. Obviously everything is still largely a work in progress, but this is the first time where I think that my game has the absolute bare minimum requirements to be called a game. So currently, colored balls spawn in the center of the screen when the timer at the top reaches zero. Then the player must drag the ball to the corresponding corner to increase their score. Once the ball makes contact with the corner, it'll disappear and the current amount left on the timer is added to the total score. Obviously nothing is set in stone and I have a ton of ideas for more content regarding scores like multipliers or bonuses. So if you've been reading the blog entries in the past, you'd know that I had a problem with getting the trajectory of the ball correct upon mouse release. So the method I settled on is a mixture of the old mouse history velocity method and a directional method. First, I use the historical positions of the mouse to create a temporary velocity. This way, if you've been dragging the ball for a bit, it'll be faster when you let go. But this led to an issue with sharp turns right before the release of the ball. Therefore, I added a second portion where it'll determine the correct direction the ball should travel in using the position of the mouse during the last two milliseconds. This way, even if you do a sharp turn while dragging the ball, it'll travel in the correct direction upon release. I still don't know if this method is the most efficient, but it seems to work fine for the interim. Obviously there might be issues with sharp movement that may be faster than the two milliseconds I allotted for, but that seems unlikely. On a side note, maybe nine days isn't much of an accomplishment to some of you folks out there, but to me this is a huge achievement and I am beyond proud of what I was able to do in such a short amount of time. So I had to ditch the old physics engine (Phaser's Arcade) because I think if I want to do collision detection for objects that aren't just rectangles, I need to use an engine that is a bit more powerful. Hence I spent the past two days learning about the P2 physics engine built into Phaser. With this new engine, I was able to do proper collision detection between two circular objects. Now if you throw the pink ball at the black round corner, it'll detect when the edges of the two circles meet. Before, there was an invisible box that surrounded each circle so collisions would occur even if visually they did not. (Which leads to a bad gaming experience of course). On a side note, try it out at this link and let me know how smooth the collision detection is! On a side side note, sorry I didn't publish a post yesterday! I want to say I forgot, but the truth is that I was just too lazy. Today was a bit more relaxing after yesterday's mountain climb (not that I finished climbing it). I played around a bit with sprites and graphics objects in the Phaser framework. I don't know if it's the best solution to use sprites when all I am planning for is a simple minimalist graphics-style. But then again, it doesn't hurt to learn new things. On a side note, let's keep today's post sweet and short. #30daydeveloper - Day 5 - Flick! Ok, actually it doesn't work perfectly just yet. For the most part it works, except in the cases where I flick the mouse too quickly, then the behavior gets a bit wonky. What I am doing is keeping a historical record of the past 100 milliseconds of the mouse locations on the screen while the mouse is pressed. Then I am finding the deltas of each two points and adding them together to create a velocity for the object. Then I assign that velocity to the object when the mouse button is released. Unfortunately, the method isn't perfect. For example, let's say I move the mouse to the right 500 pixels and then move it quickly a 100 pixels to the left, then the object will still move to the right upon release because the way I calculated was to average up the last 100 milliseconds. In other words, let's just say that if I've been moving to the right (positive x-axis, positive x-velocity) for four seconds, then switch at the last second to the left (negative x-axis, negative x-velocity) the four seconds of positive x-velocity will overshadow the last second of negative x-velocity. Thus the object will move to the right upon release, although it should move to the left because that's the direction it was travelling in last. I am satisfied for today though. You can't climb an entire mountain in one day, you have to take it one small step at a time. On a side note, feels good to get this far already! If you've noticed, I cleaned up my labels a bit more. Namely, I combined the "rants" and "random" labels together. In its stead I created a new label called "technical"--a label about all things technology. I didn't like how bloated my "1min's life" label was getting with all these new #30daydeveloper posts, so I decided to separate it out. Yesterday I left off at the steps of what I thought was a large mountain. I wish that I could say that today, I climbed that mountain and took in the breathtaking vistas of the future. But, alas, today was the day that I knew was coming--the day I did not do any coding. I expected to have at least a few days here and there of laziness or busyness. Thursdays are travel days for me so I am usually on an airplane for a large chunk of the day and am really tired when I get home. Unfortunately, because of my current newbie status, I still need the Phaser documentation available online to do any sort of meaningful coding of my game. So I apologize dear blog reader, today was the first day I did not complete the coding challenge. Here's to a better tomorrow! On a side note, it's kind of hard to think of a side note for every post when I have to post every day. I can already feel my motivation waning as each day passes. But to be fair, just because my motivation for this challenge wanes doesn't mean my motivation to develop is waning. In fact, I've been working pretty hard on the other side project that I mentioned in yesterday's post. But I don't think I'm quite ready to reveal what that is just yet. Then I want to learn how to handle mouse interactions. 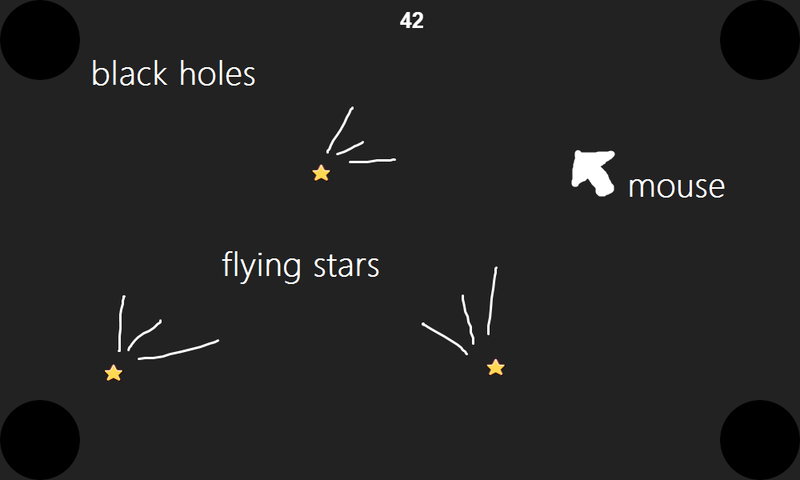 That way I can mimic finger flicks and be able to move the stars around as I wish--bouncing them off walls or throwing them at the holes. (As was the original game-play) Have you ever seen the Facebook Messenger application? In the Messenger app, you can have little pop-up bubbles for each chat you're active in. These bubbles were the main inspiration for my game. I had so much fun just dragging around the bubbles with my fingers. I wonder if anyone else would as well. Currently, the most extreme basic form of the game is already in place. Stars spawn from the top of the screen every few seconds and disappear if it comes into contact with the black holes on any of the four corners of the screen. You can also click on each star to drag it to a new position, but it won't alter the existing trajectory and velocity of the clicked star. Therefore, I want to be able to drag a star and flick it and have it travel in that direction. Initial research has proven this to be a difficult task. Perhaps this will be the first mountain I need to climb? On a side note, do you know what a GFY is and how it's much better than the prevalent GIF format? Just kidding! I haven't given up just yet. I think the fact that I am requiring myself to post a blog about my developing progress each day is motivating me enough to actually do the development work. We'll see how long this motivation will last--possibly only until the weekend when I will become super lazy and decide to stop. Hopefully not though. This morning I read a Hacker News post that really inspired me. I am really fascinated by this notion of "passive income." In fact, it fascinated me to start a different project that may hopefully be successful sometime in the near future. But until then I shall focus on my #30daydeveloper challenge. It seemed that there are entire physics engines already built into Phaser itself. So this led me to wonder just exactly how powerful is this Phaser framework? After having tinkered with it and reading through the API documentation, I was blown away by how easy it makes every step of the game development process. Everything already had classes and functions created and easily accessed. That means I might spend more time learning all the correct spelling and formatting of the Phaser nuances than actually coding the game. I might be spending a lot more time reading through the documentation than I had initially expected. On a side note, check out what I have so far! Today marks the first day of a new experiment I am doing. Dubbed the "30 Day Developer" challenge. I am taking the next thirty days to try to fulfill my two new years resolutions. 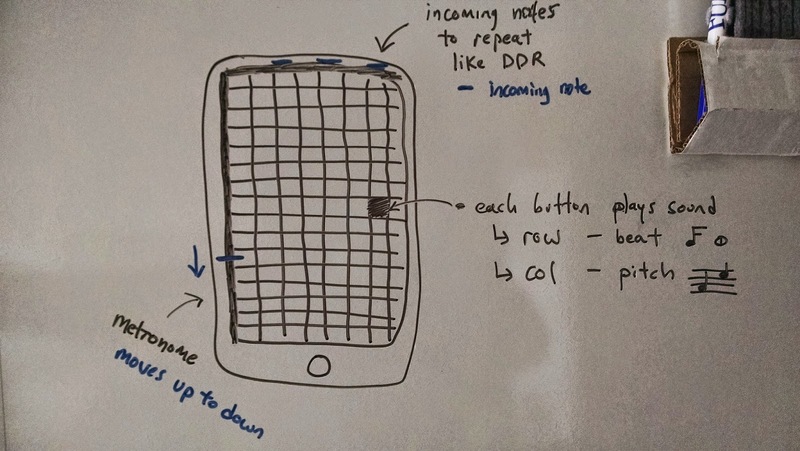 For the next thirty days, I will create a working prototype of an idea I had for a mobile game. develop for at least an hour each day. blog about the day's events and any related events / thoughts. The game is very simple (as I believe mobile games should be). Several colored balls drop from a chute onto the middle of the screen. 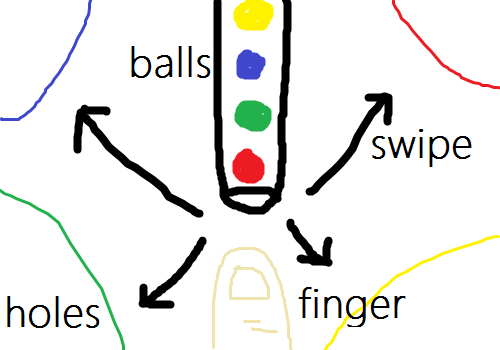 The player then used his/her finger to swipe the colored ball into the matching colored corner. The game is meant to be played at an incredibly fast pace (think Super Hexagon). I also envisioned techno-trance music roaring in the background as the user madly swipes at his/her phone. Currently my work is hosted via Heroku using Node.JS at this link. Through initial research and half-hazard reading of internet articles, I have determined that the actions of starting the development of a game and finishing the development of a game are the two hardest parts of the process. If that's true, then I am already more than halfway through--on only my first day! I don't know what will happen in the next thirty days. If history is any indication, I will post an apology one week from now saying that I failed the challenge on day two. Hopefully that doesn't happen and I will learn a great deal about myself by doing this endeavor. On a side note, please wish me luck! I don't think I've ever carried out a new year's resolution to fruition. Not that I really cared or really tried, but I guess it's just something that we as a society decide to do each year. So I figured I do it again, but maybe this time, I blog about it so I am held semi-publicly accountable to my resolutions. When I first started this blog back in high school, I used to really enjoy posting. Therefore, my first new year's resolution will be to recapture that enjoyment of blogging. When I publicly launched my newly redesigned website and blog, I felt a sense of pride and accomplishment. Something I created with my own two hands and plastered on a slice of the internet for anybody to critique or admire! Therefore, my second new year's resolution will be to create something on the internet. I don't think blog posts count as "something on the internet" because words are just words. I can type trivial nonsense about my daily life as a blog post, but I don't think that'll help either of my two goals. While I don't really know what it is that I want to create, I know that through repeated efforts, I will be able to hone in on that one special something that will be my passion. Recapture the joy I used to feel when blogging. Create something on the internet. On a side note, I really admire the blogs where a developer posts about his experiences daily as he is working on his project. The latest one I've stumbled across is Twelve Minutes. I aspire to have the same level of motivation and discipline that this developer has. Happy 2015 everyone! And a great new year deserves great new things. What originally started out as a small side project to stream-line my personal website turned into a giant overhaul of the entire design. Though I struggled with motivation throughout the whole process, but I am very proud of the outcome. Hopefully with my new website, I can kick off the new year with a fresh attitude and a happier outlook on life. While I've done some initial testing for compatibility, I don't have access to all the different form factors of the modern tech world. Namely tablets and Apple devices (the Safari browser). So if you are browsing my website and notice something a bit off, then please email me a screenshot so I can troubleshoot. Also if you've been to my website recently, please make sure to hit the refresh button so you don't have the old version still cached in your browser. But if you happen to be feeling nostalgic, you can see what the old version looked like at this link. If you have any feedback on what you like and what you don't like about the redesign, then please by all means email me your critiques, or post them in the comments section below. On a side note, I wish everyone a merry 2015 and may all your wishes come true. The best precursor to today’s post would be the post I made about a year ago. I believe that it accurately captures how I felt at the time—full of optimism and energy, with nothing but positive feelings for my future and the year ahead. Now that it’s 2015, I feel disheartened and quite melancholy at the way things have turned out. 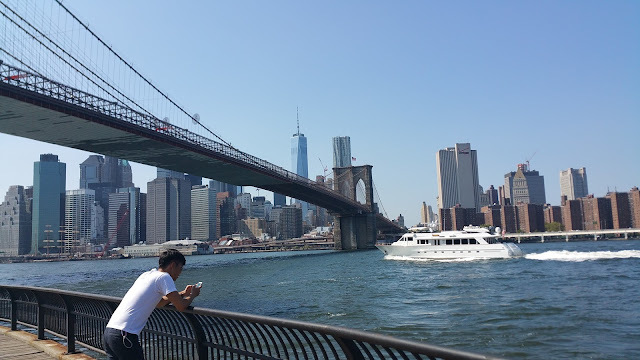 Therefore, the purpose of this post and my review of the year 2014 is to get my thoughts in order and straightened out as I move into a new year. Let’s start with my birthday—September 10. It was probably one of the most uneventful birthdays I have had in a while. I turned 23, an age that doesn't really mean anything except for being a Miley Cyrus song. But come midnight of my birthday, with my heart pounding, I was only thinking about one thing—my ex-girlfriend.